This is the age of information, in which we’re bombarded (or enlightened, depending on your perspective) with streaming news videos, blogs, texts, podcasts and various social media post notifications. So getting a plain old black and white newspaper in one’s mailbox can feel kind of comforting. At least it is for those of us (way) older than 35. We know, however, the Concordia neighborhood has a median age of 35 years. So, to provide neighborhood news and info to a broader audience (okay, I mean younger), the CNA Media Team is working to beef up more than just the quality of this publication. We are also working to improve the website and grow our Facebook presence. Why? To appeal to those people who didn’t grow up luxuriating in a morning routine that includes hot coffee, a comfortable couch, and the daily (printed) newspaper. This all takes a great deal of vigilance and effort. Six months ago the ConcordiaPDX.org website was three years out of date, and we had no Facebook page. We’ve made great strides since then but, because CNA website postings and Facebooking is performed entirely by volunteers with jobs and families, we ask for your patience while we work to improve our digital presence. Email CNewsEditor@PDX.org with story or regular feature ideas, breaking news items and events, or to submit a letter to the editor. Email CNewsME@ConcordiaPDX.org if you have suggestions for improvements or ideas forCNEWS, the website or our Facebook page, – or you’d like to volunteer to help in any of these areas, or as a reporter. Added automatic CNA Facebook posts to the home page of the CNA website. Trending on Nextdoor.com is a light-hearted compendium of what Concordians are talking about. What’s Selling in Concordia offers a quick look at neighborhood real estate data. We have a few more ideas, but your feedback on what we’ve been providing on the pages of CNEWS, on our website and on Facebook would be very helpful to ensure we’re on the path to happy Concordia neighborhood readers. We look forward to your input! And please – LIKE us on Facebook. What is your foresight, vision for Concordia Neighborhood’s future? The winds they are a changing… will it be a hurricane or a summer breeze. No, not talking about the weather but governance, locally and globally. Like it or not, the world is in for a paradigm shift. The question is, will the shift happen to us or will we to it? I look around and see whole political systems being overhauled and social fabrics being torn apart by festering injustices and poverty. In contrast, the Concordia Neighborhood appears as though we are doing quite well… or are we? I think most of us would agree on that assessment and consider ourselves fortunate not to experience the unrest we have seen in the news almost daily. The severity and impact of these events are driving changes which were usually initiated by leadership within political parties. Now, matters have become so pressing citizens have, in some cases, scrapped their representatives or taken the discussion to the street. Change is inevitable and typically understood with a 20/20 hindsight perspective. The Concordia Neighborhood is no stranger to change thanks to the many who dedicated themselves to creating the Renaissance. Concordia has become one of Portland’s most desirable neighborhoods. So no wonder we can look at the rest of the world and tell ourselves all is good. Being fortunate enough to recently move here three years ago, I and others like me are the beneficiaries of these people’s efforts, but can we sit back and go for the proverbial “free ride”? This inheritance of prosperity and wellbeing is only a gift and requires us to be proactive in its preservation if we hope to expect the same future for our children. Looking into the crystal ball, Concordia looks like it is going in the right direction, but then again, Republican and Democratic party structures had been moving along as though the road ahead were wide open. Assumptions should also be accompanied with reality checks from time-to-time if we are going to be an inclusive society and avoid reversal of fortune. When looking in the rear-view mirror, each and every one of us knows what could have and should have been done to prevent the disturbing events of late. If we are going to heal the world, what we really need is to refocus our 20/20 hindsight to foresight. Let’s take those criticisms and observations about past events and ask ourselves not what we should have done but what will we do to promote wellbeing. Each one of us is capable of bringing positive changes without having to lead the charge. Change happens in incremental stages and, dependent on small events, eventually connecting to bring about change. We can be the force for a better future just by taking small opportunities to step out of our comfort zone, reaching out to others or when we join an organization of like-minded folks. Each of these activities lets others know who we are and what is important to us. And like the great philosopher Raffi has said, the more we come together the happier we’ll be. Let’s not make any assumptions going forward, let’s have more conversations no matter if it is about skinny houses or garden club news. Let’s have an understanding and appreciation for the other… not a bad formula for peace. Lastly, Portland city commissioner Amanda Fritz has been rescheduled to appear at the November general meeting of the association. Please send me your vision for our neighborhood — one year, five years and 15 years from now — to see if Amanda is on the same page as we are, or if she needs to adjust her vision for our future. 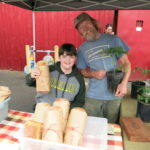 Urban farming is alive and well in NE Portland, and Cully resident Ted Snider’s new entrepreneurial pursuit aims to meet the needs of those who dig, plant, weed, feed and fertilize to grow food for their families, or those who grow and harvest to supply fresh produce to local farmers markets. 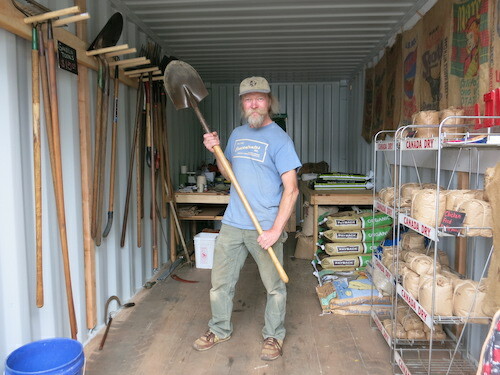 Snider recently opened Cully Farm Store from a shipping container that shares parking lot space with Roses Ice Cream on NE 42nd Avenue. From that small space, and additional canopied space behind Roses, Snider purveys used but reconditioned garden tools, supplies to satisfy chickens and their tenders; and organic soil amendments. Additionally, farmers from the surrounding neighborhoods provide vegetable starts for sale; Cully Farm Store offers these farmers an expanded market and ideally more sales. “Cully Farm Store acts as a collaborative neighborhood outlet,” said Snider, who has farmed in Cully for nearly 10 years. Snider was inspired to launch his micro-store out of a desire to help people in their efforts to grow their own food. “I want to provide the plants, feeds, and other items necessary to support and increase food growth in the neighborhood,” he said. Snider said the Cully area was historically a food-growing area. As a provider of goods to urban farmers, Snider caters to those who choose not to drive or do not have a vehicle, packaging products in small quantities to allow shoppers on bicycles to carry items home easily. “I’ve had customer walk their wheelbarrows over here and then wheel their goods back home,” he said. Snider seems to have found his calling. He attended Reed College for a year out of high school, but found the idea of desk job to be unattractive, so he discontinued his formal education. 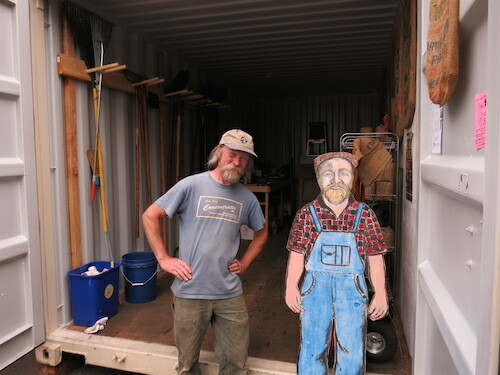 “I wanted to work with my hands,” Snider said with a smile. Find Snider manning his post at the Cully Farm Store at 5011 NE 42nd Ave. from 10 a.m. to 6 p.m. Thursday through Sunday. To enter the shop, walk between Roses and the container that serves as the store, or enter via the Roses parking lot. For more information email cullyfarmstore@gmail.com or call Snider’s personal phone (503) 729-3508. A website, www.cullyfarmstore.com, is in the works. 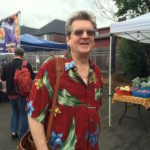 The kick-off of farmers markets around the city heralds in summer for many Portlanders, and the opening day of the Cully Market on Thursday, June 2 was no exception. Warm sunshine and a slight breeze greeted market-goers to this small but growing farmers market that’s been held for the last few years in the parking lot of Roses at 5011 NE 42nd Ave.
On market day, a lively band played music that encouraged dancing by adults and children; the aroma of grilled, smoked sausages by purveyor Southern Specialties beckoned the hungry, and Concordia, Cully and Beaumont Wilshire community members greeted each other with hugs, handshakes and smiles. Vendors at the opening event offered locally-favored Hood strawberries and plump, sweet obsidian blackberries, Red Sauce Pizza introduced a variety of homemade breads including a flavorful and satisfying jalapeno cheddar cheese loaf; tomato plant starts were proffered,and goat’s milk soap, custom creations from Metalwood Salvage and other locally-made goods were displayed for sale. The market’s website lists an array of vendors throughout the season, including Cully Neighborhood Farms, Kenai Red Fish Company, Heidi Ho Organics and Bare Naked Farms. Check the website for more vendors. 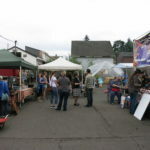 The Cully Market runs every Thursday now through August from 4 p.m. to 8 p.m. In September the market runs Thursdays from 4 p.m. to 7 p.m.
Market organizers are new this year; the event is now under the purview of Our 42nd Avenue, a non-profit, community serving business and employment development organization. Visit www.42ave. org for more information. Thank you for checking back in. First I want to state how impressed I am with our CNA board members who have been working tirelessly on our neighborhood’s behalf. I have worked with many boards of directors, in both the private and public sectors, and can say with total confidence this board is as capable as any corporate board with which I have ever worked. The board has been discussing oil train spills, toxic air and soils problems generated by industry, Summer Concerts at Fernhill Park, neighborhood Clean-Up day, and assisting Concordia University’s Community Outreach programs by offering the opportunity to reach our readers via the pages of Concordia News. We are pleased we can provide this venue to help Concordia University in its effort to make a positive impact on our community.You will find updates to some of these topics in this issue of Concordia News, and I encourage you to dig deeper for information of special interest to you. At the June 14 board meeting we heard from our own Land Use & Transportation Committee and from Mary Kyle McCurdy, staff attorney for 1,000 Friends of Oregon. Mary gave us an update on potential changes to City of Portland building code. Mary Kyle has been advocating on behalf of ͞Portland for Everyone,͟ whose focus is to provide community input to the City of Portland Bureau of Planning and Sustainability to help balance the need for increased density with the quality and character of existing neighborhoods. There is probably nothing that will impact our neighborhood more in the near and far future than the upcoming building code changes, so please keep an eye out for updates. Most importantly, give your voice a vote in the decision making process. This is no time to sit on the fence to see what happens. The board is only one voice amongst many stakeholders, so we need each one of you to voice your opinion. The public outreach phase is now kicking off. Looking forward, we have serious challenges and opportunities in which your board can play a vital role in affecting positive change, but we can only do this if we hear from you. Sad to say, but over the last six months I’vereceived only seven comments or requests for topics to be added to the board agenda. So we are working on what we believe to be your most important issues, but given the limited input, we’ve had, we might be missing something that’s important to you. This request for input is not just for board consideration, it also affects what we pursue as relevant news͟ when publishing Concordia News. Amanda Fritz, City of Portland Commissioner, has tentatively accepted the board’s invitation to attend CNA’s September 12th General Meeting. We will be asking her what Concordia neighborhood –relevant agenda items she will focus on during her upcoming city council tenure. Hearing directly from Commissioner Fritz, and helping her understand what is important to us, provides an opportunity for all parties to insure we are working together for the benefit of our community. I invite you to attend this important General Meeting. Please let me know if you have specific questions you would like put to the Commissioner. Join in this annual traffic-free event put on by the City of Portland that brings people out to enjoy their neighborhoods and discover new ones. Ride your bike, walk, or dance and sing your way along the route! The Sunday Parkways courses open up between six to nine miles of city streets to the public once a month on Sunday, from May to October. The routes connect to a series of activity hubs with marketplaces that are usually stationed at parks. At these marketplaces find food, music, dancing, good conversation, city resources and more. This month, the route is right here in our neighborhood, so join in the fun. The eight mile course is open on Sunday, July 24, from 11 a.m. to 4 p.m. This event will showcase the Northeast Neighborhood Greenways. While you make your way around the Northeast Portland route, stop by Woodlawn, Alberta, and Fernhill Parks where a collection of fun activities, festive music, and delicious food will be available. 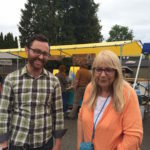 Look for the Concordia Neighborhood Association booth at Fernhill Park on the NE 37th Avenue side, too. They’ll have games for kids and association information. 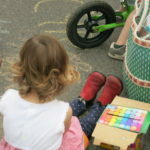 This year, NE Sunday Parkways will return to Khunamokwst Park, at which there will be a Bi-lingual Bike Fair held in collaboration with the Andando en Bicicletas en Cully (ABC) Group. Sunday Parkways provides a full day of play for anyone of any age. To get the most out of the day, stop by one of the Sunday Parkway hubs and pick up a Sunday Parkways brochure highlighting the hotbeds of activity along the route. Also find information on live performances and theatrical acts. During the event, visit Sunday Parkways on Facebook or Northeast Sunday Parkways JULY 24 Twitter for event insight into what’s going on throughout the day. Don’t forget to eat and shop locally at the event! Sunday Parkways offers a chance to see and buy a range of products that Portland offers. Stop by the Sunday Parkways marketplaces located at each park. For more information visit www.portlandoregon.gov/transportation/58929. Late last year, Alberta Main Street received a grant from The William G. Gilmore Fund of The Oregon Community Foundation to fund Equitable Alberta Street. 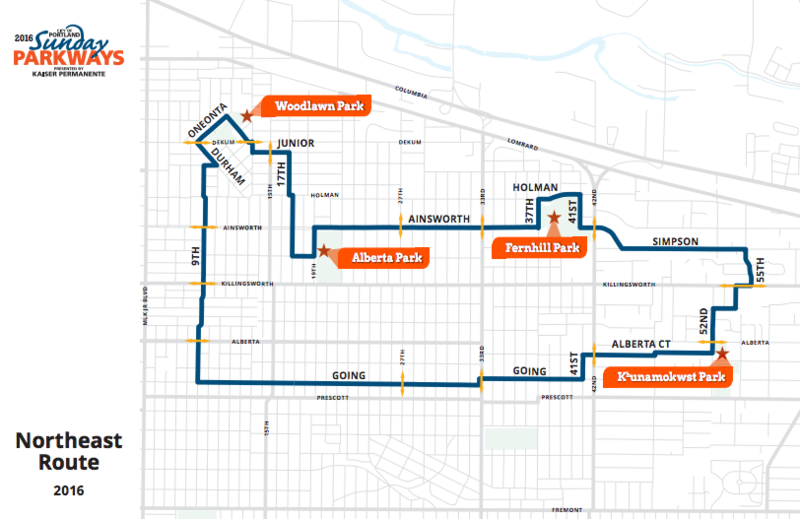 The project aims to expand the organization’s capacity to address issues related to equity, diversity, and inclusion on and around NE Alberta Street, and to ensure that underserved populations are informed about and supported in their efforts to access social and economic resources available to them. providing technical assistance and AMS financial support to underserved populations. Budd identified the means by which she will approach those goals. “My work will include forming relationships with the variety of people and cultures that represent our diverse community,” she said. Budd brings over 10 years of experience as an educator and consultant, training senior leaders and developing measurement tools for businesses to help improve diversity outcomes. While her efforts will primarily focus on the commercial corridor, Budd hopes area residents will play a role in addressing inclusion issues as well. She cites the need for residents to reach out to each other; to be welcoming, but she acknowledges the challenges to that effort. “Because of systematic disinvestment and displacement, mistrust has grown over the years. To rebuild trust will take time,” she said. Budd also encourages neighborhood newcomers to become more knowledgeable about the history of the area to understand the displacement that has occurred over the years. To learn more, she suggested visiting Alberta Main Street or the Research Room at the City of Portland Archives & Records Center (1800 SW 6th Ave, Suite 550). Some information is also available online on the Main Street website and the City Auditor’s website. Budd lives in the Overlook area of North Portland. Reach her Tuesdays and Wednesdays at the Alberta Main Street office (1722 NE Alberta Street), by email (kenya@albertamainst.org) or call (503) 683 – 3252. she said. Budd brings over 10 years of experience as an educator and consultant, training senior leaders and developing measurement tools for businesses to help improve diversity outcomes. I’ve been asking myself: As a community so far from the world stage, can we really make a difference? Considering even our legislators can’t agree on the time of day much less promoting goodwill abroad, I wasn’t so sure. But then I took a close look at our community and realized we can have an impact in the world just by being friendly and approachable. We can start with the foreign-born students attending Concordia University; they are our portals to the Middle East, Asia, South America and beyond. These students should be our ambassadors, telling the real story of America upon returning home. So I ask you, what would happen if each one of us extended ourselves to these visitors in the same way we do with those who live here? You might ask how we do this. The answer is to just say “hi” and smile. A smile is the same in any language, the rest will follow. It is a start and if we do it enough, we can positively impact the world. Now back to business matters. At its last general meeting, the CNA board was presented with the concept of paying for professional assistance in producing the Concordia News. The board agreed to do so, starting with the July issue. I for one strongly support the idea of part-time, paid staff people, as I believe the Concordia News is the single most important avenue of communication within our neighborhood. CNEWS is looking good now, due to the efforts of professionals who have been volunteering over the last several months. And, over time, it’s projected to pay for its production costs. But I believe the newspaper will cease publication if we do not retain the skills and time dedicated by professional staff. Visit www.concordiapdx.org/get-involved/ open-staff-positions for information about the available positions. Also high on the CNA agenda is our search for a new Treasurer to replace Robert Bowles, our outgoing Treasurer. He has served for much of the past decade. As modest as we are, CNA actually has a rather large budget compared to most other Portland neighborhood associations. Robert has done a wonderful job shepherding our finances, but he’s moving on to new challenges. If you, or anyone you know, have basic accounting skills and a few volunteer hours to devote to your neighborhood, we’d love to hear from you. Lastly, the ongoing discussion with Ascend Holdings, the developer of the Bighouse site at NE 30th & Killingsworth, has hit an impasse. (See article by Spencer Parson’s on page 7 for more information.) The developer’s representative recently told the CNA Land Use & Transportation Committee (LUTC) that Ascend is moving forward on construction of a 4-story apartment building, as submitted originally, to the Portland Bureau of Development Services. The rub is that LUTC had made suggestions to make the project more “neighborhood friendly.” The developer, however, had issues with the suggestions and would not provide a response to LUTC, nor did Ascend want LUTC to have any formal say in its plans. I became involved in the LUTC/Ascend Holdings issue after their communication broke down. I cannot go into specifics, but I do know there was no one bad guy involved. I am hoping the developer will come back to the table to consider our concerns as a model of how to work with a community. It could be a re-start, but our experience is telling us that CNA – and the City – must provide all developers with not only the building code, but also a profile of neighborhood sensitivities. Doing so would be a positive approach to avoiding problems in advance of final plans. While we are a diverse community with a variety of people and opinions, we expect compromise. We are not looking for an “I win – you lose” situation but for win-win. The only way that happens is by talking to each other. I will continue my discussion with Ascend and keep you up to date. Or come to CNA Land Use Committee meetings and follow along. Chicken hind quarter with garlic cilantro mojo served at Forge, one of Alberta Street’s newest restaurants. The Original Halibut’s fish and chips shop at 2529 NE Alberta Street closed last summer and moved down the road to the Piedmont Station Food carts at 625 NE Killingworth Street. They still serve the same menu of fried chips, fish and chowders, but from a bright blue food truck. Their next door neighbor, Enzo Lanzadoro of Enzo’s Caffe Italiano, has moved into their former space and created a new restaurant in its place: Forge. At a soft opening in mid-April, the large fireplace was the center of attention with Forge. chefs cooking with its crackling wood fire. Forge also features concrete floors and counters and a bar that seems to be a long stack of bricks. There are rough-hewn wood tables and iron work throughout. 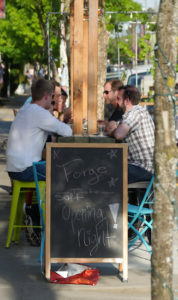 Customers enjoy the outdoor seating at Forge. 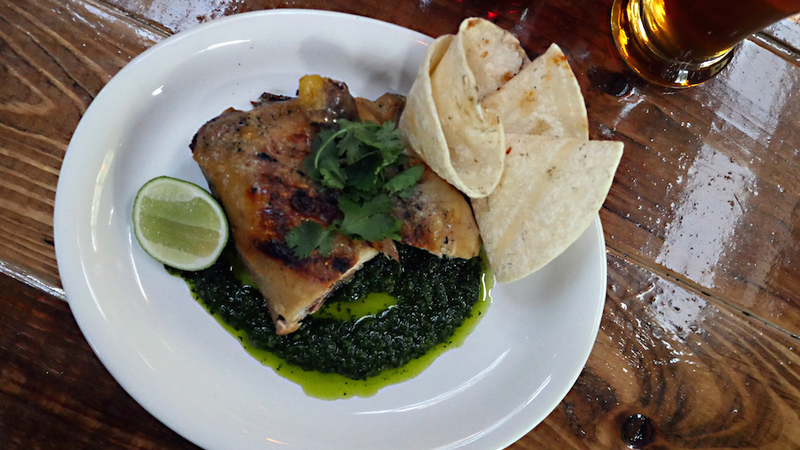 Forge is a counter-service only restaurant that seeks to be both casual and friendly. It will be open from breakfast through dinner. By late-May Forge will have a full menu of wood fire-cooked meats and vegetables. “The idea is to have an open fire – nothing gets cooked on a stove. Imagine yourself camping in the morning you’re going to have eggs and bacon cooked over the fire – with the smell and everything,” said Lanzadoro. The rest of the day’s menu will feature steaks seared on hot coals of either alder or oak, a variety of fish, yard-long sausages on hardwood planks and slowcooked rotisserie chicken. There will also be a lot of vegetables, not just meat. Mushrooms, eggplants, zucchini, cauliflower, and broccoli will all be available roasted over the fire and with sauces. Forge has a full bar with a limited beer and wine selection. There’s outside seating in the front and sides of the restaurant. An on warm days, the windows will be thrown open to let in the breeze.